Welcome to Kilohana! This is a very unique vacation rental in Upcountry Maui. 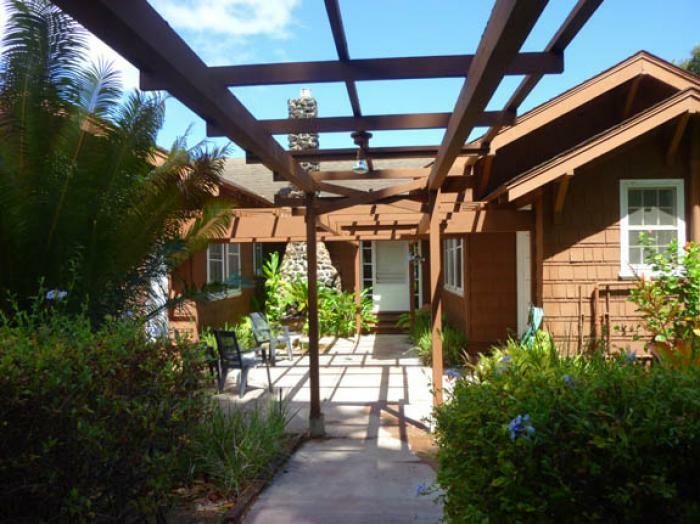 Kilohana was designed and built in 1916-1917 by the Haleakala Cattle Ranch as a retirement home for its first Ranch Manager, Louis von Tempski. The closest thing to an urban center in Upcountry is Makawao. Today Makawao is a lively community of cowboys and hippies, with galleries, boutiques, and restaurants. In the renovated stores, you'll find everything from a general store and an old-fashioned barbershop to health food, holistic medicine, and designer fashions. You can buy feed for your horse or gourmet olive oil for your kitchen, a bowl of saimin or fettuccini with porcini mushrooms. The town is a paradox of old paniolo and new age, pickup trucks and BMW's. That's what makes Makawao special - the old welcoming the new in the true Upcountry spirit. And all of this is just a mile down the hill from Kilohana. Forgot the bottle of wine for dinner? No problem... run down to Rodeo General Store in Makawao. We are happy to share our piece of Maui’s history with you and look forward to welcoming you to Kilohana! 1. Neighbors - Please be considerate of our neighbors. Noise carries easily to their homes, particularly in the evening. NO loud music, NO parties, NO amplified sound of any nature at any time. Many neighbors must be up early in the morning to go to work, and it’s important that your use of Kilohana does not impact them in any way. 3. Use of the Property - Additional friends/family CANNOT be invited to the property and it cannot be used as a “meeting place”. The property can be used ONLY by the guests listed on the rental agreement (maximum 7 guests including children).